1. Doomsman (1967) is not supposed to be a worthwhile Harlan Ellison work… and one of his few novels. Part of a giant pile given to me by the family friend mentioned in my last acquisition post! And there’s a short Lin Carter novella included as well…. Note: The cover is quite humorous. 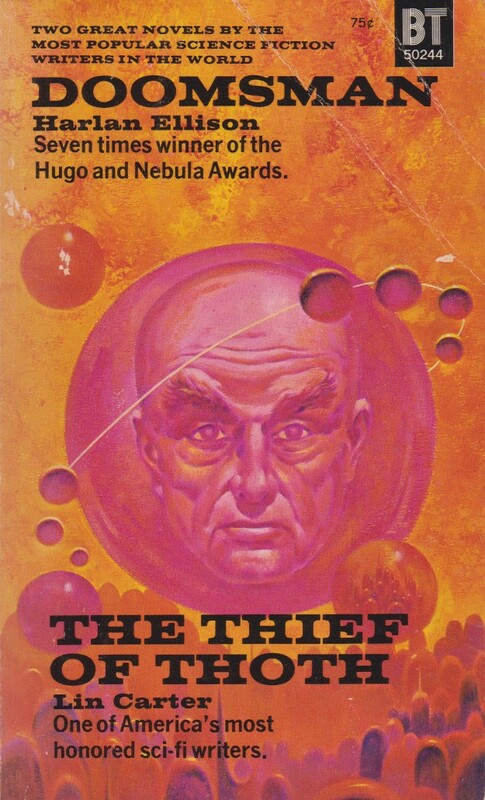 Paul Lehr, despite an isfdb.org error in citation, clearly added his touches (the shapes at the bottom, the planets, the colors) to an existing SF image. The face is copied from Ed Valigursky’s cover art for the 1955 edition of Isaac Asimov’s The 1,000 Year Plan (1951). 2. More Jack Vance! And his first novel — also from the gift stack. And you know me and immortality (a favorite theme)–> I’ve compiled a list here. 4. Lawrence Durrell, yes the same Lawrence Durrell, wrote two novels (The Revolt of Aphrodite sequence) that are classified as science fiction. I’ve finally found a copy of the first in the sequence. Note: covers are hi-res scans of my personal copies.